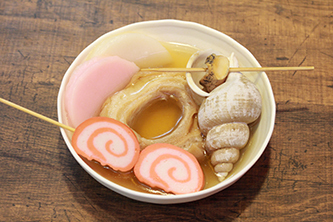 Baigai 350円 田螺 바이가이' Ivory shell　One of the representatives of the Kanazawa Oden. 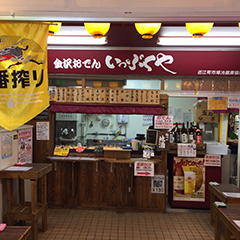 The king of the Kanazawa Oden. 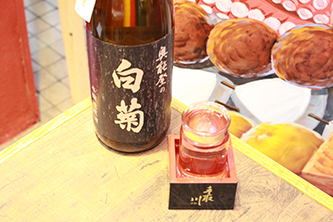 Akamaki 130円 赤巻 아카마키' One of the representatives of the Kanazawa Oden. 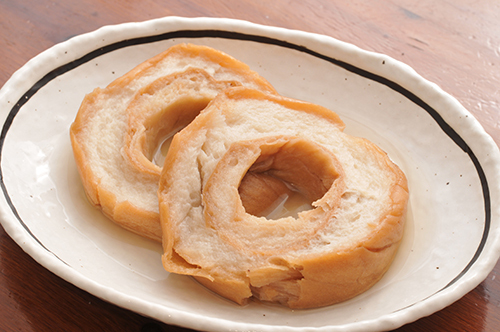 It is a kind of kamaboko, boiled fish paste, which is well known in Hokuriku area. 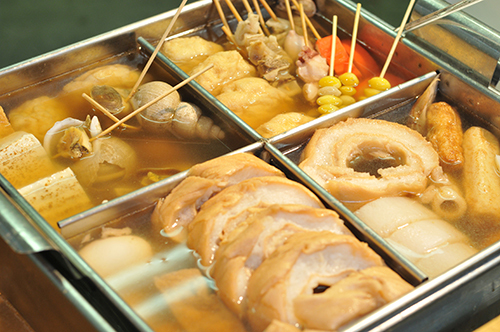 Chikuwa 100円 竹轮 지쿠와' Chikuwa is grilled paste of fish in the rod-shape. 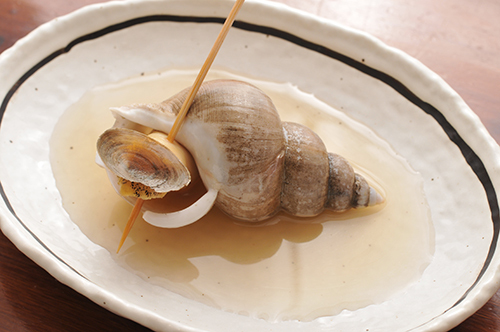 Gyusuji 180円 牛筋串 규스지' I stewed cow muscle for a long time and softened it. Gobouten 130円 牛蒡天 '고보텐' deep-fried burdock root in a light batter. 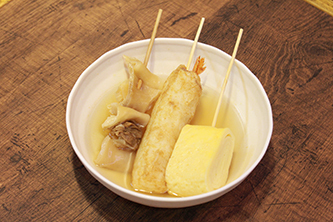 Burdock root is wrapped in minced fish, and it's a kind of fried fish cake. Ebiten 200円 虾天 에비텐' deep-fried shrimp root in a light batter. 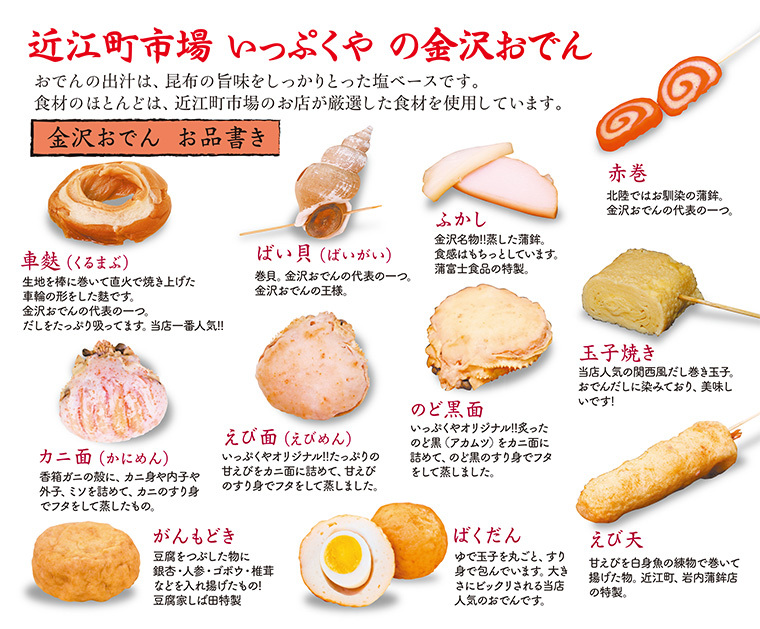 Omi-cho Iwanai kamaboko shop special. You will enjoy the savory smell of shrimp jammed in the paste. 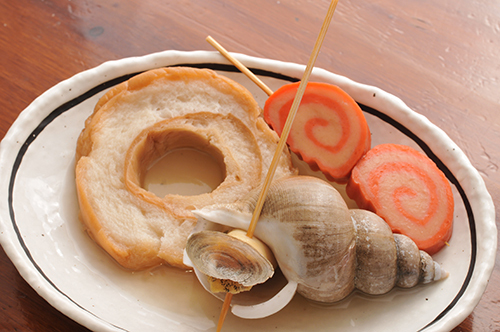 Bakudan 390円 爆弾 폭탄 I covered the boiled egg fish paste and fried it. Yakidouhu 200円 焼豆腐 구운 두부 Grilled tofu　Omicho tofu house Shibata special. Atsuage 230円 油炸豆腐 아쓰아게' Omicho tofu house Shibata special. It is thick fried tofu. Kurumabu 구루마후' 180円 가나자와를 대표하는 오뎅 중 하나. 우리가게에서 가장 인기 있는 오뎅. 밀가루그루텐으르로 제조. Fukashi 후카시' 180円 가나자와 명물! 찐 어묵. Ebi-menn 에비멘' 600円 가나자와 오뎅의 새로운 명물!! 우리 가게 오리지널!! 단새우를 게껍질에 채우고 단새우를 갈아서 뚜껑을 만들어 쪘습니다. nodoguro-menn 노도구로멘' 900円 우리 가게 오리지널!! 노도구로라는 생선을 구워 게껍질에 채우고, 노도구로를 갈아 뚜껑을 만들어 쪘습니다. Japanese radish 다이콘(무)' 200円 인기 최고! 오뎅의 왕! Yakidouhu 야키도후(구운 두부)' 200円 오미초시장 두부공장 시바타에서 제조 100퍼센트 대두사용, 무첨가 수제 두부. Atsuage 아쓰아게' 230円 두부를 튀긴 것.
Ganmodoki 간모도키' 380円 두부를 튀긴 것. 속에 은행, 당근, 우엉, 표고버섯 등이 들어 있습니다!! Gyusuji 규스지' 180円 소의 근육을 오랜시간 보일한 후, 오랜시간 육수로 맛을 냈습니다. Stuffed cabbage 롤캬베쓰' 300円 간 돼지고기를 양배추로 말아 만든 것.
Mochginchaku 모치킨차쿠' 150円 인절미를 유부에 넣어 만든 것.
Ebiten 에비텐' 200円 단새우를 간생선을 입혀 튀겨낸 것.
Gobouten '고보텐' 130円 우엉을 간생선을 입혀 튀겨낸 것.
Bakudan 바쿠단(폭탄)' 390円 삶은 계란을 통재로 간생선을 입혔습니다!! 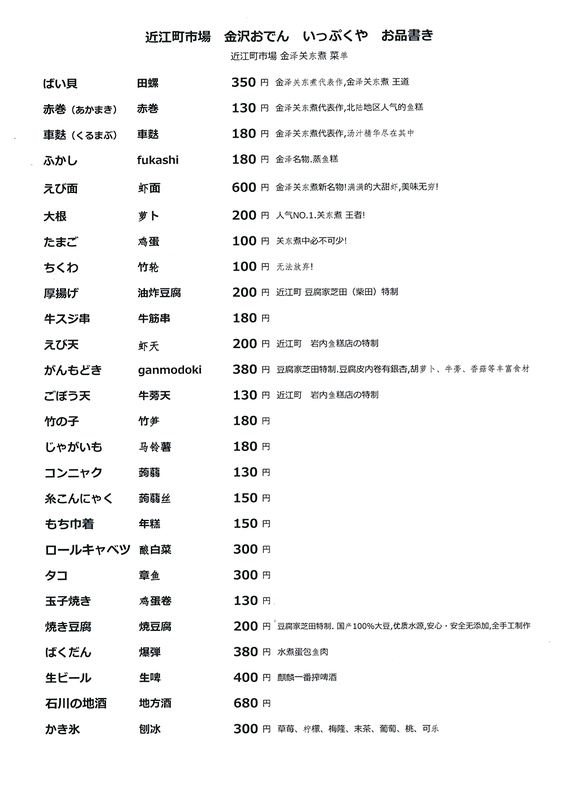 Copyright(C) かち組カンパニー　株式会社 All Rights Reserved.